She is an inspiration for many. With the glittering crown resting on her head, Nadeepa Ransinghe was a picture of poise and confidence as she took on the questions. For women who had perhaps lost themselves in being moms and wives, her story is a fine example of grit and determination which ended up not only being a successful woman but a multitasker as well. From clinching the Mrs. Sri Lanka 2018 for Mrs Universe 2018 to representing Sri Lanka at the gwlobally acclaimed beauty pageant and conquering her dream of serving the Sri Lankan army as a commissioned officer (Captain - Legal Officer), Nadeepa has a number of skills to boast of. The old girl of Sri Sumangala College, Panadura, has mastered Kandyan dancing and Bharatha Natyam for Bhathkanda Indian exams at Erandathi Lalitha Kala Ayathanaya. She had worked as a child artiste at Sri Lanka Broadcasting Corporation as a dubbing artiste and later worked as a presenter at the Independent Television Network before becoming a full time news anchor and news producer at Swarnavahini. She also enrolled as an attorney at law in the supreme courts of Sri Lanka in 2008. She has also penned a book titled ‘Gambura Saha Addara” with Upul Shantha Sannasgala in 2002. 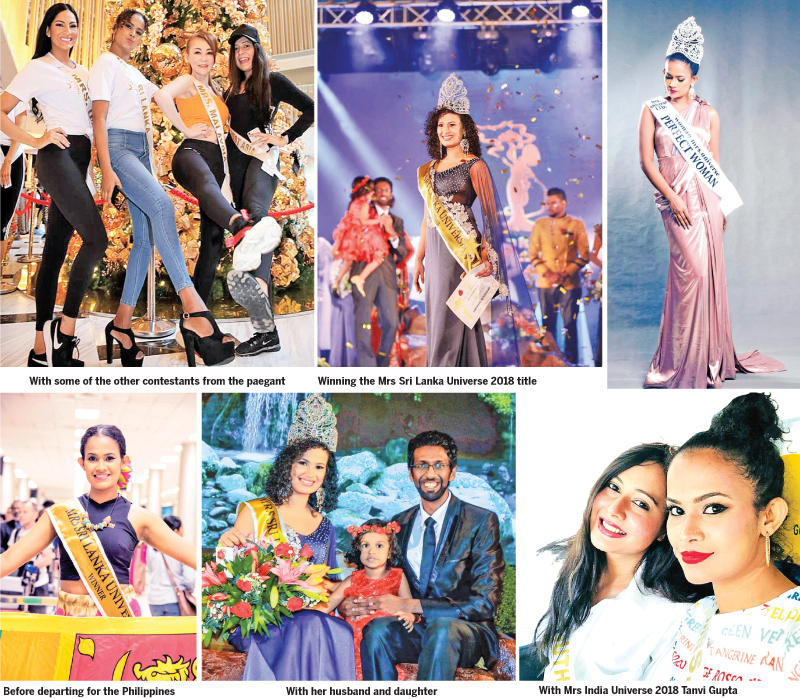 She won the mini title of ‘Mrs Perfect Woman’ for her extraordinary academic and professional achievements at the Mrs Universe 2018 pageant held in Cebu city, Philippines. Contestants from around 90 countries across the world took part in the pageant in which Julia Gershun from Monaco was crowned as the winner. “There was a warm welcome and great anticipation for Mrs. Sri Lanka at the event. Most of them already knew me by my name before I even introduced myself while some of them preferred to address me simply as ‘Sri Lanka’. The Philippine citizens were admiring me for my unique Sri Lankan complexion, features and natural curly hair. In fact they said that ‘natural beauty’ is something they hardly find and they really liked me for my natural looks,” Nadeepa explained. She believes that the speech on domestic violence and sexual exploitation which she gave during the special forum was one key feature which helped her bag the title. “I shared my experiences as a lawyer who had been with the victims and shared their grief while helping them get back on their feet and live a better life. I also shared my experiences as an army officer, a news anchor, a journalist and an entrepreneur while being a mom,” she said. She says that she learnt lessons on peace, togetherness, love and harmony from nationalities that were facing similar hardships and challenges. These similarities made them feel like they were one big family. “Listening to the experiences and life stories during the forum was a very emotional moment. We realized that we are all going through similar ordeals and expecting, praying and dreaming of the same prospects. We discussed about the burning issues related to domestic violence and sexual exploitation. We shared similar mindsets, ideas and feelings. This made me wonder why this world is fighting against each other, and why we are killing innocent people in some countries. We all are human beings. We should help each other. We need to stand up for all human beings - not only for Sri Lankans or Buddhists, Muslims, Christians, Hindus etc. I know this is not a new idea, but there is a huge difference between knowing things and experiencing them,” Nadeepa opined. She says that the whole pageant has been quite a memorable episode for her as they were treated like celebrities and were given government sponsored VIP security. “There were three luxury buses for transportation and they were surrounded by police cars and bikes when we were driven from one location to another. Huge crowds gathered beside the road, waving at us. We were escorted by armed security guards. The citizens of the Philippines followed us everywhere and took selfies with us and got our autographs. Everyone was so friendly and welcoming,” she enthused. She notes that the whole journey had not been as easy as it seemed because beautiful; multi talented women from all over the world were posed to represent their nation to the best of their ability at the event. “Most of them have spent a lot for their designers and outfits. They had their own teams for makeup, hair dressing, and hired assistants to help them. I travelled alone and I did all the things by myself. I am so happy about it. My effort made me the ‘Perfect Woman’,” she added with a laugh. She says that Mrs India Universe 2018 Tanvi Gupta from Kolkata was her best friend during the pageant. Géraldine Haesebrouck from Belgium and Kathelene Victory from Gibraltar too have been close to her. “I wish we were in one country! I really miss them,” Nadeepa sighs. Buddhist philosophy inspires her and drives her forward during difficult times. She says that the power of intention, the focused mind and the deep understanding of reality makes life easy and fills one with compassion. Queried on her definition of a ‘Perfect Woman’ and Nadeepa says that It is your attitude and positive thinking that makes you so. “It is also in how you look at yourself and how you fulfill your dreams by following what you are passionate about. The world will never recognize a woman as ‘perfect’. People will always see a fault every time they see us. It is beyond our control. Literally we cannot be perfect, but we can be content. That content feeling in our lives makes us perfect. You need to be unstoppable, inspire other women and always try to empower them. The feeling of being content and the determination within you to achieve your dreams is what makes us ‘perfect’,” she expressed. She stressed the need to be prepared to learn and go through tough times in whatever field one chooses to follow in their life. One needs to have a lot of courage and undying passion to reach the top. “Unlike other countries across the world - the role of a mother in Sri Lanka is a bit difficult. Mothers are unfairly expected to do more than what they are capable of doing and given no time or space for personal care both physically or mentally. Apart from being able to manage your time well, you need the support of your loved ones to understand you and support you to attend to activities that lift your spirit. Regular exercise, dancing, singing, entertainment and reading are very important for a relaxed mind. That will help you bring your hidden potentials to the limelight. The society will try to push you to a corner and break your wings but you have to fight against it,” she pointed out. An entrepreneur who has her own baby product brand ‘Seven Petals’ to her name, Nadeepa says that her range includes environment friendly, chemical free, alternative baby products which. Due to the high demand for the products she had to stop importing them. She aims to launch them into the local market and had created a number of job opportunities for local women through her brand. Nadeepa’s father, Ranasinghe P Liyanage, is a retired journalist. Her mother, Menike Ranasinghe, is a retired education instructor attached to the Department of Probation. She has a brother who is a professional photographer. She is married to Creative Director and Visual Effects Supervisor Chamath Paranawidana. She has a four year old daughter named Yuwaarya Shine. “Winning a crown is more than just a victory. There should be a purpose behind it and I feel that I carry a responsibility on my shoulders. I have always been interested in reaching out towards the needy, being a voice to the voiceless and being a role model to those who battle with the challenges of everyday life. I have been given a great opportunity now to go ahead with this passionate task to launch my own charity foundation and do my part for the women and children in need. I have planned a few projects that will commence from my home town - Kalutara and Panadura,” Nadeepa concluded.